I’ve been meal planning for months and over the last month or so, I’ve decided to start adding one vegetarian meal per week to our menu. I have been successful but have been turning to the same recipes, so I needed to expand my options and found this recipe. It was really good and I modified it slightly from the original recipe. The next time I make it, I plan to replace the kidney beans with black beans. Heat oven to 375 degrees. In a large bowl, mix beans, chile peppers, chili powder, salt and cumin. Microwave for 1 minute and slightly mash beans. Add corn and cheese and combine. Add 1 cup of the enchilada sauce to the bean mixture. Spread 1/4 cup of the enchilada sauce in a 13×9 baking dish. Brush one side of the tortilla with the enchilada sauce. Spoon 1/4 cup of the bean mixture into the center of the sauced side; roll up tortilla. 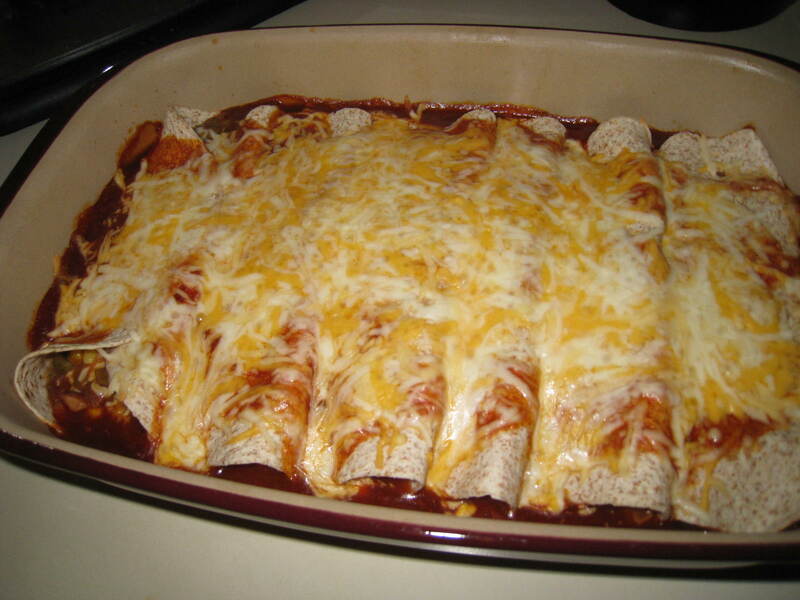 Place rolled enchilada in a baking dish. Repeat with remaining tortillas and bean mixture. Pour remaining sauce over top to cover. Top with remaining cheese.